Blended Learning Produces Awesome Results! We utilize online Distance Learning Modules (DLM) to facilitate classroom learning and minimize out-of-field time and expense. DLM’s are designed to facilitate the “education” component of an overall training experience and improve subsequent classroom learning. DLM’s are designed to maximize educational effectiveness. Individual DLM’s are commonly designed to require students to pass a test before proceeding to the next DLM, and then pass an overall test before moving on to classroom learning. 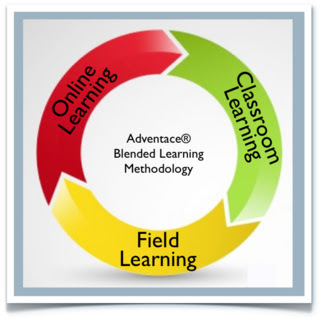 In addition to facilitator-lead discussion, deep learning and the ability to execute effectively in the field can be achieved through a variety of blended learning methods in the classroom, including business games, simulation, and social learning. Business games provide significant benefit to helping sales people develop skills as they provide the opportunity to practice, build, and demonstrate new knowledge and expertise. We divide business games and simulations into two categories: Individual and Team. At the team level, students participate in a competitive team case study, called the Proposal Review. It is a “closing event” given to a buying committee at the end of a complex multi-product solution sale. Although it can be nerve-wracking, it is a very exciting event where tremendous learning takes place. And it is very competitive! The buying committee is usually made up of the instructor and actual sales executives from the customer. Further, the winning team usually wins a significant sum of money! Modeling: The instructor and instructor’s assistant model a skill to be practiced. “Speed Dating” Skill Development: This is a technique that adds a great deal of energy and excitement to the traditional role-play. Star Stamp: This is a competitive enhancement to the Socratic nature of our workshops. This simple technique results in a great deal of communication! Everyone wants to “get on the board” with at least one star! Many attendees want to earn the most! The true benefits of online learning and classroom learning manifest themselves in the field, where proactive management support helps change seller behavior with metric based performance improvement over the long-term. Put a Personal Development Plan™in place for the skill deemed most critical. Personal Development Plans target metric-based performance improvement within a quarter. It is very common to see a seller overcome a long-standing difficulty where they were rated as a level 1 performer (that is the low end in our management methodology). And, with proactive management backed by their Personal Development Plan, achieve level 3 (that is the high end in our management methodology) in only one quarter or less. With that is very common for the performance flood gates to open!